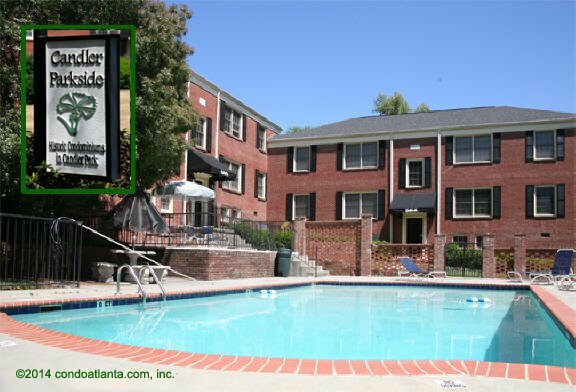 Candler Parkside is a handsome swim community of garden style condominium homes. Love living in the Heart of Historic Candler Park just a short distance to Atlanta’s Little Five Points L5P, Freedom Park Trail, the Atlanta Beltline and the Eastside Trail. Walk or enjoy a bike to Inman Park, Virginia Highland VaHi, or Piedmont Park. Community amenities include a swimming pool for the enjoyment of homeowners. Want to live here? We can help! For more information about available homes in this community and others, and your home search wish list, or to list your home for sale, call on us… CONDOATLANTA.com is a full service real estate brokerage. We work with home buyers and home sellers, and look forward to speaking with you. As part of your home search with us, we can set up automatic notification of new listings for the communities that interest you the most. Inman Park, Kirkwood, Candler Park and the Old Fourth Ward combine historic area neighborhoods and parks with easy access to the Heart of Modern Metropolitan Atlanta! Walking communities including the lovely development of lofts, condominium homes and townhomes, village style shops and eateries, fabulous art and music festivals are all part of the living landscape that make these areas sweet places for many residents to call home. Love living in Candler Park, a neighborhood on Atlanta’s East Side, just south of Ponce and minutes to the Heart of the City, and host of the Fall Fest featuring music, an artist’s market, fun for the entire family, a road race, and more!